I know when you reference an article on another website, you shouldn't post the whole thing, but it's tempting to do just that for Michael B. Jordan's letter to Entertainment Weekly, on the internet's reaction to his casting as the Human Torch in the upcoming Fantastic 4 feature film reboot. Actually that makes it sound like the whole internet reacted the same way (which is a gross overstatement), so retract that. It's his reaction to those who can't fathom why a caucasian super-hero could be cast as a person of another ethnicity. People who sadly enough were noticed by the mainstream media, who then unfortunately reported on 'comic fans' as a unit, sharing the same volatile perception. Hopefully his letter registers with some, because Mad Max: Fury Road has added fuel to my ongoing fire, that Charlize Theron would make an awesome 'Storm' for the reboot teased to follow X-Men: Apocalypse (and not just because of her South African heritage). "It used to bother me, but it doesn't anymore. I can see everybody’s perspective, and I know I can’t ask the audience to forget 50 years of comic books. 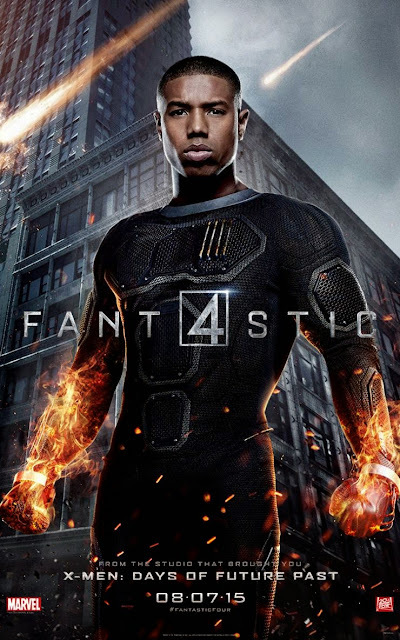 But the world is a little more diverse in 2015 than when the 'Fantastic Four' comic first came out in 1961. Sometimes you have to be the person who stands up and says, “I'll be the one to shoulder all this hate. I'll take the brunt for the next couple of generations.” I put that responsibility on myself. People are always going to see each other in terms of race, but maybe in the future we won't talk about it as much. Maybe, if I set an example, Hollywood will start considering more people of color in other prominent roles, and maybe we can reach the people who are stuck in the mindset that “it has to be true to the comic book.” Or maybe we have to reach past them." And there you have it. While I can picture casting directors would have an easier job if asians could only play asians, gays couldn't play hetrosexuals, short people couldn't play tall, I'm glad such a systematic process dissolves by the day. As a fan I am proud that Fantastic 4 will be another landmark movie in this process, even if it was hoping to come out in an era when such a change wasn't a 'landmark' at all. What a load of pompous tripe (the letter, not your post). He should get over himself. I don't hate him in the slightest, and I'd be just as opposed to Luke Cage or T'challa being portrayed as a white guy as I am with a white superhero being portrayed by a black guy. It has nothing to do with racism, because I'm not a racist. It's about giving the long-term fans the heroes they grew up. If they made Johnny Storm a woman (Joanie Storm? ), I'd be opposed to that as well. (Just as I would if the Invisible Woman became the Invisible Man.) Just give us the heroes we know - please. Thanks for the thoughts Kid! See, I don't mind the ethnicities of fictionalised characters changing, like I said above, I think Charlize Theron would make an awesome Storm, just as I think Laurence Fishburne made for an excellent Perry White. Growing up I lived in a small town were only five comics were available at the local supermarket right up until my teens. Iron Man, Batman, Fantastic Four, Marvel Star Wars, and X-Men. FF was always my favourite and I feel I grew up alongside Johnny as he matured more so than 'Spider-Man' who I only saw on random trips to the city, so the character means a lot to me too. It is interesting hearing people's views on this, and it sure has caused a lot of people to 'flame on' - which has to be a sign to Marvel at least of how many people care for a franchise often labelled 'out of date to modern audiences' in comparison to edgier franchises like Batman and X-Men. I think as two people who care a lot about the FF we can both be glad of that. I even read yesterday 'What if Othello was white?' Considering that play's subject matter, that would be pretty difficult to do, but it made me think. The history books tell us not many people had a problem with Shakespeare getting men to play female parts in his plays, and that was decades in the past. Here's hoping (from my perspective) the same books will soon say people don't care if ethnicity is an issue in playing fictionalised characters too. I don't think ethnicity IS the real issue, Dan, at least in the following way. If a white guy plays a white guy and a black guy plays a black guy, who the hell cares? However, when characters who have a 50 year back-story are changed to 'reflect a more diverse society' (which is nonsense in itself - society has always been diverse), then an agenda is at play. However, in some ways, it's a storm (no pun intended) in a teacup and doesn't mean that the movie will be bad, or that Michael B. Jordan won't do a good job. It's just that it won't be the Johnny Storm that I grew up with, and there's a small voice in me somewhere saying that that's kind of sad. I think it's arrogant of movie-makers to take it upon themselves to decide what is and isn't important to an established character's essence. In some ways we should be colour-blind, but in this case it's perhaps better to maintain respect for how the character was conceived. "It's not important that he's white" is pretty insulting to a lot of (non-racist) white guys who identified with Johnny in their youth. The movie-makers might just as well have made up their own group called The Fabulous Four, where the characters have similar powers to Lee & Kirby's, but are multi-racial. It also kind of bugs me that these movies aren't being made with a comics readership in mind, they're aimed at a far wider audience - which is understandable. - but it's almost like our we're being ignored because we're a minority, relatively speaking. I still don't see why they can't make a movie that caters to the tastes of diehard comic fans and wider audiences alike. One last point: Whatever it is that might appeal to the sensibilities of a black audience when they see a character being played by a black actor (if, in fact, they even care) should surely be taken into account in the case of white audiences too? Surely we should be allowed the same consideration for OUR sensibilities when it comes to seeing an established white character being played by a white actor. Too many white characters, not enough black ones, someone cries. Then create some new ones, don't change the old ones. How's that for a radical idea? 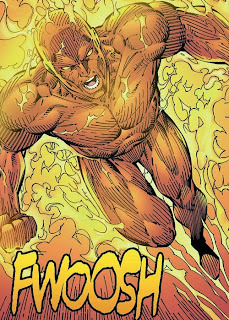 I really don't think that, in the case of Johnny Storm's ethnic switch, it's a racial issue - it's just that most comic fans want to see the characters they grew up with on that cinema screen. No worries Kid - you can speak on anything that itches you here. Go for gold mate, you are always welcome! i'm so over this drama of Jhonny Storm being black if you can deal with Nick Fury being black that you can deal with this too. I think the much bigger concern should be if this FF reboot is going to be better then the last two cinematic abortions of this franchise. besides, I like this actor he was really good in one of my favorite sci-fi movies in recent years, Chronicle. he also did a good job in the independent movie Fruitvale Station which was about an accidental shooting of a black guy by a white cop years ago at a train station not far from where I live. Thanks Dave! He was great in Chronicle huh - hadn't heard of Fruitvale Station but will look into it!